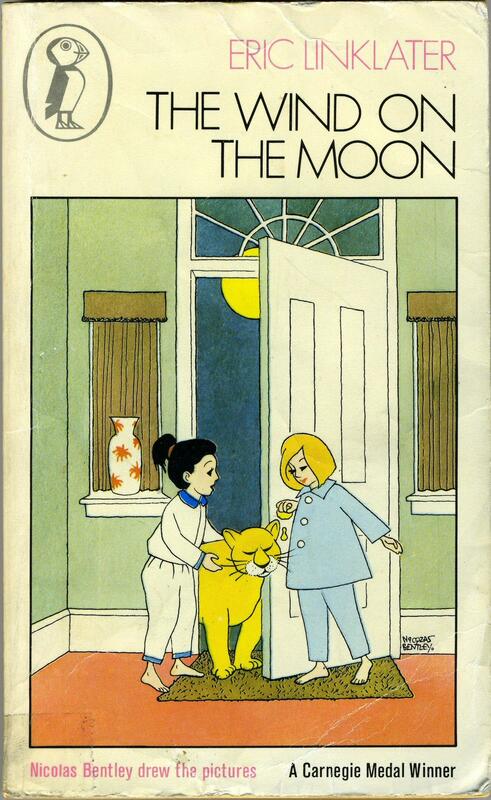 I first encountered The Wind on the Moon by Eric Linklater when I was about seven years old and my mother read it to me and my little brother as a bedtime story. In the years between then and my picking it up again last week, almost all of the details of the book had escaped my mind, though I remembered a) that the protagonists were called Dinah and Dorinda, and dimly b) that there was an element of subterranean escape. I approached it, then, as if anew. The children’s books adults like most of all tend, I suspect, to be favourites of their own childhood. There are many classic children’s books I have read since leaving childhood behind (if, indeed, that is what I have done; often it feels otherwise) in which I have found a great deal to admire but not much to love. This book has had a much more profound effect on me. Dinah and Dorinda, the daughters of Major Palfrey, live in the town of Midmeddlecum. They are well intentioned but often find themselves in trouble. 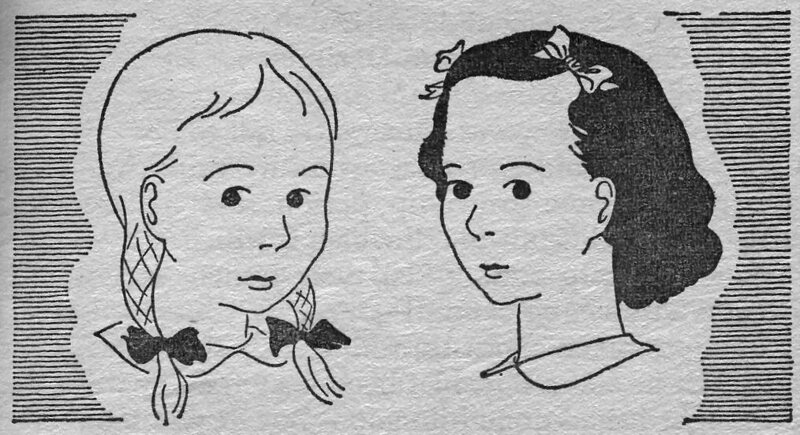 Dinah is fair-haired and clever, while Dorinda is dark-haired and brave. The book begins on the eve of their father’s departure for the continent. He warns them: ‘When there is wind on the moon, you must be very careful how you behave. Because if it is an ill wind, and you behave badly, it will blow straight into your heart, and then you will behave badly for a long time to come.’ No sooner has he left the room than they hatch a plan to tie bells to the apple tree outside the window, which prefigures the many mischiefs they will perpetrate during the year of his absence. Their home life becomes disagreeably flat with their father gone, and they spend much time trying to escape visits to Dr Fosfar, who is absent-minded and sometimes puts his glass eye in his waistcoat pocket and a piece of india-rubber in his eye socket, and their lessons with the humourless governess Miss Serendip, who talks almost entirely in facts. A visit to the sometimes invisible witch Mrs Grimble, who lives deep in the Forest of Weal, presents Dinah and Dorinda with the opportunity to transform themselves into kangaroos. This metamorphosis enables them to expose a serial thief at the local zoo, and they make a number of new friends along the way, most notably the Golden Puma and the Greenland Falcon, who will accompany them in their further escapades, but also Bendigo, the grizzly bear who reads the Times (and Observer on Sundays), and Mr Parker, the giraffe who, like the girls, used to be human. ‘Weren’t you a giraffe when you were born?’ asked Dinah. ‘You had become a giraffe,’ said Dinah. ‘I had,’ said Mr Parker sadly. 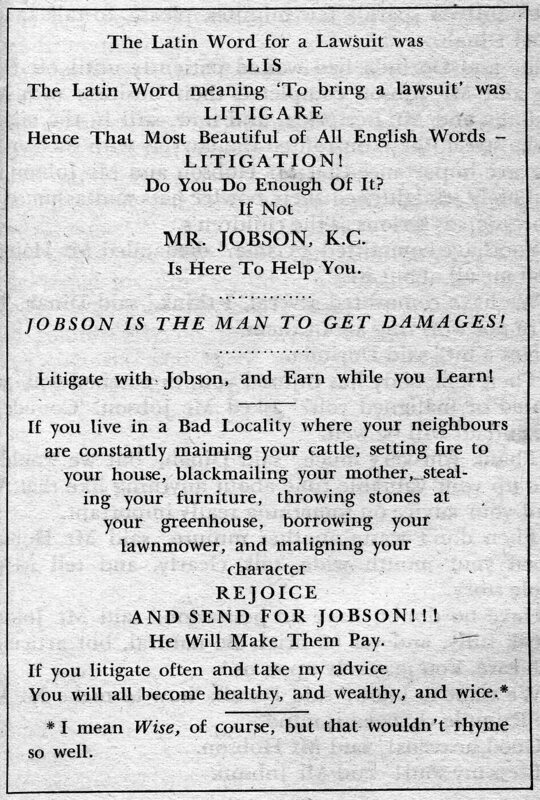 After returning to human form, the girls enlist the help of lawyers Hobson and Jobson, who spend their days knocking on the doors of housewives touting for trade (‘Good morning, Mrs Wellaby. Have you committed any crime today? Petty Larceny or Grand Larceny, Fraud or Sacrilege or Sorcery, Blackmail or Theft by Forcible Entry, Assault or Battery, or Assault and Battery?’), to persuade the town’s judge to release the twelve jury members he has harshly imprisoned for failing to return a verdict. The prisoners include their music and dance master Mr Corvo, whose absence from their lives they have felt keenly. When news reaches them of their father’s own imprisonment in the European state of Bombardy, Dinah, Dorinda, Mr Corvo, the Greenland Falcon and the Golden Puma set out on a quest to free him from the villainous clutches of the tyrannous Count Hulagu Bloot. Above the front door was the banqueting hall, and on the same floor in the tower to the right of it was Count Hulagu Bloot’s private suite. The banqueting hall was decorated with glittering suits of armour and gigantic oil paintings of the rulers of Bombardy through the ages, and of scenes of battle; while the walls of Count Hulagu’s private sitting-room were hung with disgusting pictures of people being tortured, and the skins of tigers, lions, bears, and leopards, the heads of which rested on little shelves and glared into the room through great glass eyes, and snarled with bare and yellow teeth. In one corner were some dumb-bells, a skipping-rope, and a Sandow developer for the muscles; and in another corner a bookcase with a book in it called How to Make Friends and Influence People. Bloot is a marvellous creation, terrifying and camp in equal measure. He loves torturing people, but refrains if he thinks their screams will aggravate his headache. He summons various servants by firing his revolver at his armour-plated ceiling. He is devoted to peppermint creams. What I have written so far may give the impression of light-hearted adventure at the expense of all else. This is not the case. The book was published in 1944, winning that year’s Carnegie Medal, and the themes of justice, imprisonment and freedom resonate throughout the book, particularly in reference to animals. The great tragic figure of the book is the noble Golden Puma, unable to thrive either in the zoo, where she is confined by her cage, or in the outside world, where she is hunted by farmers for killing their livestock. Though I can’t claim to have had any strong feelings either for or against zoos in my childhood, I can imagine that by a more receptive child the book might be read as a persuasive treatise against the imprisonment of animals. But the Puma rose and walked towards them, slowly and not speaking. She stopped before Dinah, looked up at her, and then with a light and easy movement laid her fore-paws on Dinah’s shoulders. First on the one side, then on the other, she rubbed her head against Dinah’s face, purring like a great cat, and Dinah felt on her cheeks the warm harsh fur, the wiry bristles, and the thin dark lips of the Puma. Dinah kissed her between the eyes and laughed aloud. Then the Puma greeted Dorinda in the same way, and Dorinda kissed her, and she too laughed with sheer delight because she had for a friend so beautiful a being as the Golden Puma. There is a mystical, mythical aspect to passages like this that perhaps brings C.S. Lewis to mind. Reading the book as an adult, I feel that a great deal of the magic it possesses arises from Linklater’s infectious love of the natural world, of the sights, sounds and smells of nature, and from the relationships that living creatures, both human and animal, form with the trees and plants and earth that surround them. The Puma proceeds to talk about the smell of the forest, of regaining her strength, of running freely once more, and of her pursuit and capture of a deer. Linklater finds a joy in the natural order of things. The copy I read this time was of the Puffin edition from 1972, which bears a beautiful cover illustrated by Nicolas Bentley (son of Edmund, inventor of the clerihew). Bentley’s idiosyncratic illustrations of various gangly, willow-limbed beings appear throughout the text. 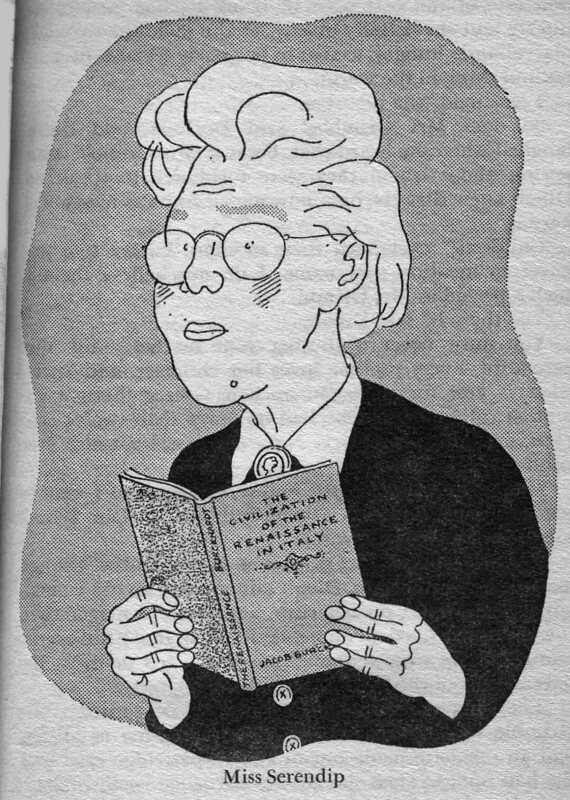 I particularly love his drawing of Miss Serendip reading Burckhardt. I bought this copy second-hand; it was formerly the possession of Joanne Bell, 5 Wheatlands Pk, Redcar, Cleveland. A note at the end of the book states that The Wind on the Moon “appears in the [Library] Association’s list of children’s books which should never be out of print.” I don’t know whether such a list remains in existence, let alone whether this book is on it, but happily it is currently in print in at least two editions, one from Jane Nissen Books in the UK, and one from the customarily excellent NYRB in the USA. It deserves to be available in perpetuity. This entry was posted on November 4, 2010 at 12:06 am and is filed under Books. You can follow any responses to this entry through the RSS 2.0 feed. You can leave a response, or trackback from your own site. I can’t believe how vividly you paint the picture of my exact same reaction to this book. I too grew up reading The Wind on the Moon — the very same paperback print edition that you speak of here. My father also did, which is how I was introduced to the book in the first place. I loved the book growing up and I love it no less now. My father and I often throw random WOTM quotes into our every day conversations — for example, any mention of pepper will receive an almost automatic response of “Plato calls it a food for the Gods”, and calling anyone or anything poor in any pitying context elicits the “Poor Puma!” “Poor us!” gambit. Thank you. It’s nice to know that we’re not alone.